1. 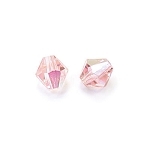 Take one ball pin and add 1 – Light Rose AB 4mm Glass Crystal Bicone. Create a loop in the ball pin. Make a 90° bend in the ball pin above the bead. Using round nose pliers and hold the ball pin near the angle and bend it around the pliers to make a loop. Wrap down around ball pin creating as many coils as you can. Trim any extra. 2. Repeat Step 1 THREE Times to complete all 4 Light Rose AB 4mm Glass Crystal Dangles. 1. Take one ball pin and add 1 – Light Siam AB 4mm Glass Crystal Bicone. Create a loop in the ball pin. Make a 90° bend in the ball pin above the bead. Using round nose pliers and hold the ball pin near the angle and bend it around the pliers to make a loop. Wrap down around ball pin creating as many coils as you can. Trim any extra. 2. Repeat Step 1 THREE Times to complete all 4 Light Siam AB 4mm Glass Crystal Dangles. 1. Take one ball pin and add 1 –Light Siam AB 4mm Glass Crystal Bicone. Create a loop in the ball pin. Make a 90° bend in the ball pin above the bead. Using round nose pliers and hold the ball pin near the angle and bend it around the pliers to make a loop. Wrap down around ball pin creating as many coils as you can. Trim any extra. 2. Open the loop of one Antique Silver-Plated eyepin and add the loop of the Light Siam AB 4mm Glass Crystal Bicone Dangle you just created. Close the eyepin. 3. Add one Light Rose AB 6mm Glass Crystal Bicone to the eyepin from Step 2. Create a loop in the eyepin. Make a 90° bend in eyepin above beads. Using round nose pliers hold the eyepin near the angle and bend it around the pliers to make a loop. Wrap down around eyepin creating as many coils as you can. Trim any extra. 4. 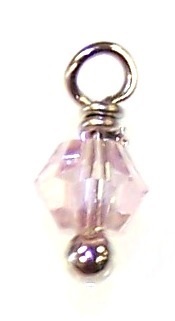 Repeat Steps 1 - 3 ONE time to complete both of the Light Rose AB 6mm Glass Crystal Double Drop Dangles. 1. 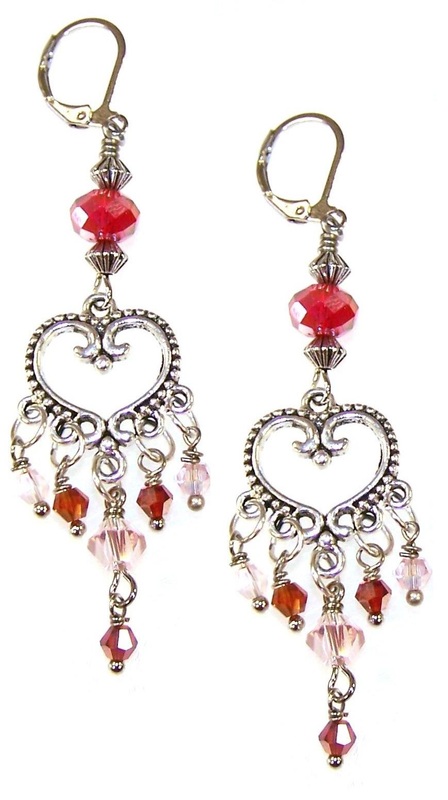 Twist open one 5mm jump ring; add the loop of one Light Rose AB 6mm Glass Crystal Double Drop Dangle and the center loop of the Antique Silver-Plated 19x21mm Heart Connector. Twist the jump ring closed. 2. Twist open one 5mm jump ring; add the loop of one Light Siam AB 4mm Glass Crystal Dangle and the right inner loop of the Antique Silver-Plated 19x21mm Heart Connector. Twist the jump ring closed. Twist open one 5mm jump ring; add the loop of one Light Siam AB 4mm Glass Crystal Dangle and the left inner loop of the Antique Silver-Plated 19x21mm Heart Connector. Twist the jump ring closed. 3. Twist open one 5mm jump ring; add the loop of one Light Rose AB 4mm Glass Crystal Dangle and the right outer loop of the Antique Silver-Plated 19x21mm Heart Connector. Twist the jump ring closed. Twist open one 5mm jump ring; add the loop of one Light Rose AB 4mm Glass Crystal Dangle and the left outer loop of the Antique Silver-Plated 19x21mm Heart Connector. Twist the jump ring closed. 4. Twist open the loop of one eyepin and add the top loop of the Antique Silver-Plated 19x21mm Heart Connector. Twist the eyepin loop closed. 5. 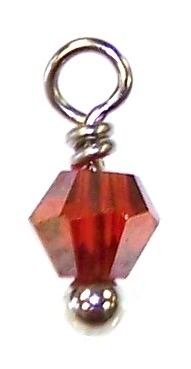 Add one Antique Silver-Plated 4x5mm Bicone Metal Bead, 1 – Red AB 8x5mm Glass Crystal Rondelle, and 1 – Antique Silver-Plated 4x5mm Bicone Metal Bead to the eyepin from Step 4. Create a loop in the eyepin (make the loop go in the opposite direction for the bottom loop). Make a 90° bend in eyepin above beads. Using round nose pliers hold the eyepin near the angle and bend it around the pliers to make a loop. Wrap down around eyepin creating as many coils as you can. Trim any extra. 6. Twist open the loop of one of the leverback earrings. Add the top loop of the eyepin from Step 5. Twist the earring loop closed.